The harmonic box is done. The front and back glued together, and inside is the label with my fiddle’s name, “Chanson Epinette”, Spruce Song in French. And then my name, Marcy Luikart and the botton line, Santa Barbara, California 2015. A label to establish the provenance when a few hundred years from now someone finds it in a pawn shop, or at a garage sale, if people still have garages in a few hundred years. and they will peer inside the F hole and the faded letters will tell them where and when it was created. And someone will wonder who this Marcy Luikart was and it will be a rare and unusual find, this fiddle from the early 21st century. And maybe someone will wonder about why there are no other instruments by this obscure craftsperson and there will be nothing to confirm or deny that there was only one, except these blogs which will have long since faded into the infinity of zeros and ones. But I get ahead of myself. It has been a year since I began this process. Four months on the practice back to learn some of the tool skills and nine months with the real instrument. Brian thinks I will be done in June. That is my goal, to have my finished instrument to bring with me to the Live Oak Music Festival. I have to be careful and not be a mother hen about this. This is going to be my instrument. It will come with me to music festivals and camping trips. It will not be something to hide away and only play in the safety of my home with the perfect humidity and coolness. It will breathe in the air like it did when the wood stood in the forests of Europe and birds nested on it’s branches and insects crawled on the bark. I am thinking about who I can get to play it when it’s finished. Someone other than me, someone who can plumb the depth of it’s sound. But I have time, six months. And still so much to do, the scroll, the neck, the varnish, the bridge, the sound post. So many details. My mind explodes with the precision of it, but I am on the end of the journey. The label is in. It is purfling time. Brian has a tool that lays the track, two faint lines etched into the wood. They are a bare millimeter apart, maybe two, maybe three, but they seem impossibly close together. I have my 5x magnifiers so that I can see the barely there line. And the knife with the surgical steel blades, the blades that are made for delicately slicing the broken parts of humanity so that they can be made whole again. I take the knife and slice into the line, no not even slice at this point, I barely push against it to deepen the groove. Both sides, an imperceptible deepening like a trickle of water that becomes a deep river. And I search for the metaphors in that process and the one of discovering the story, because they are linked, the birth of one engendering the birth of the other; an odd pair of fraternal twins, sharing the same womb. 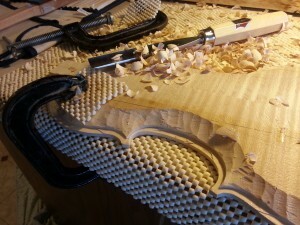 I cannot rush either, the unfolding of the story or the making of the violin. I lay down the line and gently push the channel, deepening as it unfolds. If I rush it doesn’t happen. If I try to force it, to make it go faster I have ruined the wood, I have nothing that lasts, nothing that resonates through time and space. It hurts my finger, the maple is hard and yet it’s not. It moves with the pressure, it parts as easily as if the fibers are held by nothing more than a thought. My thought that pushes against the resistance of logic and makes the channel creates the groove. I go outside the line. It is inevitable, my hand is not quite steady enough. My magnified eyesight still does not see clearly. But after a few attempts I find it and the line is deepened and once the line is deepened the next pass is easier. I have a clear track to follow. I am no longer lost in the deep snow. My metaphors mingle and clash with one other but they do the job. I just need to breathe. I just need to slow down and let myself truly see. So now we are in the long haul. The Look at me, Look at what a cool thing I’m doing phase is past, and now when I write, it is the little tidbits of what I’m doing that I have to write, but is it interesting? The small minutiae of the project. At least nine hours on the platform. Probably more, but I lost track of time. That’s what happens when you deal in 10ths of millimeters. How many millimeters to the moon, how many millimeters to the big bang back in time and space. How many millimeters, how many words until I discover the story. 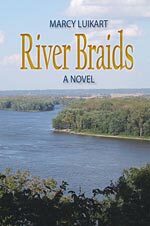 These projects intertwining, the novel the fiddle, I lose one and find the other. And I am mired in the long slog through the mistakes and the missteps and the insecurity of where it goes. At least with a fiddle I know where it’s going. But I went too low on the platform. 2/10 of a millimeter. How could that really make a difference? I measure, I carve, no I don’t even carve, there isn’t enough room, I measure I file, dust, saw dust, that isn’t sawed, file dust, like stardust that falls from the wood as I file and measure and file and measure and, OH S**t, too much, how did it get to be too much? Brian says we can fix it. But I know it’s there. A mistake, life. No one else will know, but I know. 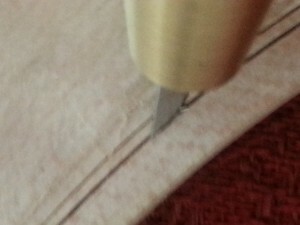 I know that there will be a thin veneer glued onto the platform, but in the end does it matter? What matters is the sound, the tone, the song and the story. And now I carve. I am settled in to the routine and it hits me, truly, that this is not an overnight task. I mean, I knew it would take time, of course I knew it. 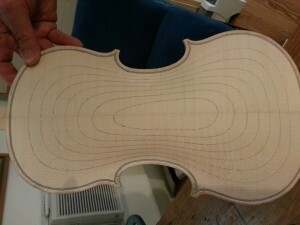 Brian said he calculated that it takes a student around 300 hours to complete an instrument. That’s a lot of hours. And much of the time is spent in the detailed work. The carving and measuring, the ceaseless carving and measuring. I have finished my rough arching, which gets the wood to the basic shape and now I have to work the platform. I am nervous about the platform. Carving things flat is difficult. I seem to list to one side or the other. And while I worry about the measurements and destroying the wood, I find myself thinking about the long tradition whose coattails I am grabbing onto. I listened to a Radio Lab podcast the other day and the theme was Things. http://www.radiolab.org/story/things/ (If you’ve never listened to Radio Lab, you must, it’s not an option, go, listen…..) In the opening sequence Robert Krulwich discusses the difference between how he and his wife relate to things, specifically things from the past. Things that have cultural, emotional, scientific significance. And it got me thinking about my relationship to things and how they spur the imagination. My husband and I were on a trip to England and we had just visited the Daphne de Maurier museum on Bodmin Moor. We meandered around the moor on our way to find a place to spend the night and on the way one of the maps said we were near an historical ruin. We found the spot to park our car but there was no real clear signpost as to where we were supposed to go. We were racing the daylight but I really wanted to see the ruin and didn’t want to give up. We finally found it. I don’t know exactly what I’d expected but it turned out that the ruin was nothing more than the rock footprint of a town or village. It was clear that the rocks were not random. I could imagine the walls that had arisen from the rocks. It was a medieval ghost town. There weren’t even things at that spot just stones laid out but I imagined the people walking and sitting and knitting and cooking and arguing and crying. And what does all this have to do with me making a violin? As I scrape away my millimeters of wood I find myself connected in a very tactile way to the past. It is as if I touch the past as if I carve away more than wood. I carve away years, I carve away time. I time travel. 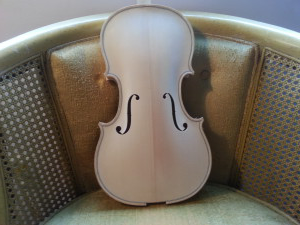 This violin I am making, the violin I now play, the violin that is played in the concert hall, the violin that is played in the mountains of West Virginia, the violin that is played in the Mariachi band, the violin that is played in Scotland, Ireland, Rumania, the violin that is played in rock band, all of them every last one are born of the same beginnings. They all trace their source back to the workshops of 15th century Italy. And I carve the way they carved. I scrape and file and measure with almost exactly the same tools. The music played may be different, the music arises from the individual cultures, but the instrument spans them all. The instrument binds us. Today I got a blister. It took many steps to get to that blister, somehow I’m lagging behind and have to catch up to where I am. meet perfectly is not easy. There can be no gap and my brain doesn’t quite get how to tell which side is high and which is low. It’s all so subtle and I have to make sure that I keep the plane completely steady. There is a tendency to push more in the center so the edges are off. Brian is very kind and lets me think that I’m helping, but this task I happily leave to him. 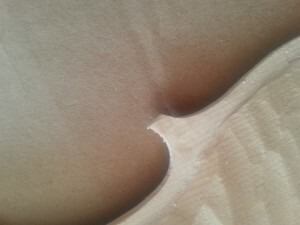 We glue the halves together and take a small shaving of the join. It is perfect. The fit is so tight that it is hard to see the line. When I sculpt in clay joining two pieces is easy. I score the two sides and then add water and pull the clay across the join until there really aren’t two distinct pieces anymore, the clay has been joined and one piece has become the other. Wood isn’t clay and the two pieces that need to be joined are really always separate. They are separate but held together by the glue that fills the invisible empty spaces. The join is a thin line that is all but invisible but I know it’s there. 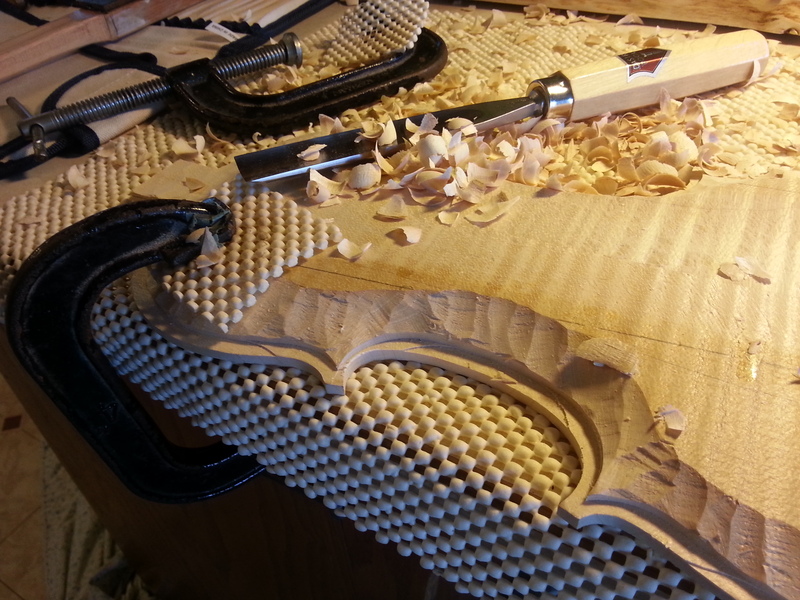 Once the joins were done I traced the shape of the ribs on the top and bottom. This is it. The individuality of dimension is set. Whatever small variation came into play when the ribs were bent, this now dictates what my fiddle will be. The ribs won’t be used again until it’s time to put the pieces together. So now they sit on a shelf in the spare room keeping company with the fingerboard that, too, must wait its turn. 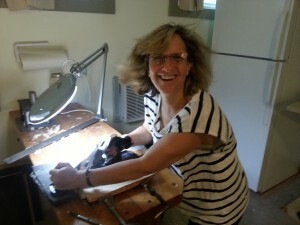 And then I sawed out the pieces with the aptly named coping saw. They call it a coping saw, I am sure, because it is very difficult to cope with. The blade turns, which is handy, but my brain cannot figure out which way it’s supposed to go. I muddle through and in the end I am way too far from the line which means I will have to file a ridiculous amount of wood. Oh well. I am missing steps. The filing, the planeing somehow they disappear. Like all the photographs I never took of family vacations and times past. The days, the hours, I didn’t write them and now they merge together and end in the blister I got today.